Old Emulator Forum- The old BBS message board. You can't post any new messages here- post those on the new board that is linked above- but there are some good answers and tips in these older messages. Classic99 was formerly the 'Ami99 Emulator'. It is currently in version 3.1a2, and has been updated to include new ROMs, 'magic' disk ability has been added so things like Editor/Assembler can have their support files available, a menu for ROM/system selection has been added, and it now had more reasonable defaults for today's machines. Still a work in progress, but most functions work. See the 'readme' file for more information. You can use the same ROM and GROM image files as for V9T9 or MESS (I had to rename the MESS file '994agrom.bin' to '994agrom.gpl' in order for it to work). PC99 runs in the DOS enviorment and emulates the TI-99/4A and some peripherals. You can also purchase licensed versions of TI Command Moudule images as well as scanned versions of manuals. Download some of my TI disks in PC99 format. Download v9t9 6.0 documentation. If these files didn't come with your copy of v9t9, unzip them to a directory named Docs within the V6.0 directory. On some computers, V9T9 does not detect the processor if it is a 386 or higher. To remedy this, Kerry Lee High Jr. has removed the processor check from v9t9.exe. If you've been having problems, download v9t9fix.zip, unzip it, and replace v9t9.exe with v9t9fix.exe. V9T9 Mini Memory bug fix by Jim Z. This zip file contains the V9T9DS.EXE file, which is the V9T9.EXE modified by Andy Becker on July 2001 so as to handle Double Side Disks on V9T9. Lapinkult's TI-99/4A Page- Freeware programs in V9T9, ASCII, and PC99 (see below) formats. A really cool TI emulator for Windows that started out on the Amiga. Writen in C, requires a set of TI ROMS. Open source Linux TI-99 emulator. M.E.S.S. (Multi Emulator Super System) now offers emulation of the TI. I don't own a Mac, so I have no personal experience with this emulator but it apparently uses the same file types (Disk and ROM) as the PC version of v9t9. The author states that this version is incomplete and he is not certain when he will make a final release. An emulator of the TI-99 clone, the Tomy Tutor. A link to Cameron's Tutti Emulator information page can be found on his web page: The Little Orphan: The Tomy Tutor. 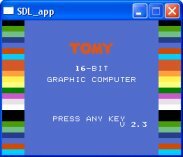 Ian Gledhill has written a Tomy Tutor emulator that runs in Windows. For more information, check out Cameron Kaiser's Little Orphan web site or the Tomy Tutor Yahoo Group (source code available here). The emulator is version 1.0 and requires the SDL Library in order to run. Be sure to check out Ian's retro-computer website at www.retroreview.com. requires (G)ROM images to run at all. A fairly simple, text only emulator. As far as I can tell, it only allows you to operate in TI-Basic.